Well I got myself a new camera to 'replace' the Leica C-Lux1, which is an OK camera as long as you don't have to use flash and as long as you shoot outside. The new camera is the Sony DSC-T900. The following photographs are a mix of the Leica and the Sony. Basically I was trying to familiarise myself with the Sony and its capabilities. I have to say that I am impressed with its Marco capabilities. Also I am trying out my new 'white box' and my new white light. 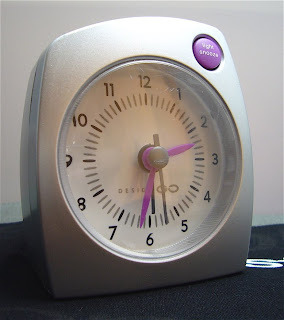 The clock in question is a travel alarm clock that we got off a news-stand in Heathrow Airport about a year ago. 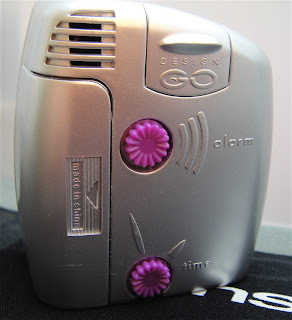 It is one of those cheap travel alarm clock that comes in a blister pack. The brand is Design GO. 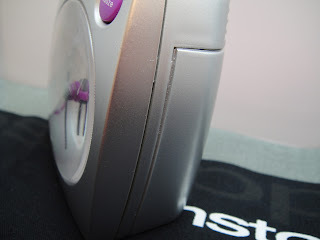 It is silver in colour and has pink/ purple buttons. 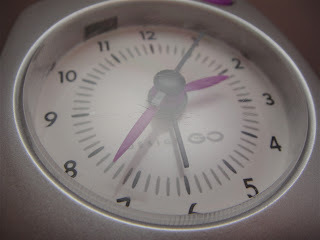 I am using this clock to test the Macro capabilities of the Sony. The clock is 68 mm at its tallest point and 59 mm at its widest. It is 35 mm thick. 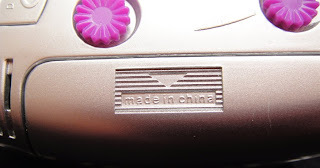 It is all plastic and it is made in China. It is powered by a single AAA/ LR03/ MN2400 battery. 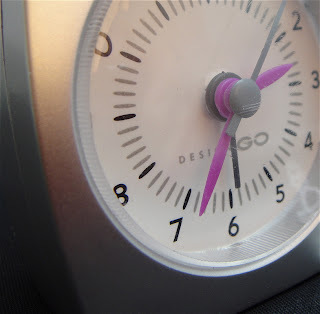 The dial is white and it has the hour and minutes index. The hour index is rendered in black while the minute is grey. There is also the Arabic numbers for the hour markers. 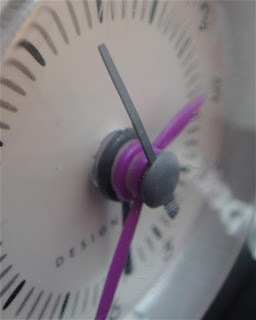 The hands are made of plastic, with the hour and minute hands in pink/ purple. 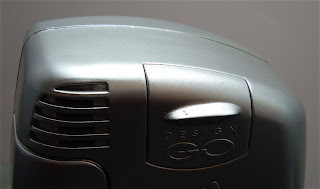 The second hand is grey and the alarm hand in darker grey. 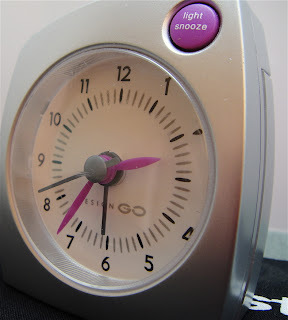 There is a light/ snooze button at the top right corner of the clock. The light is provided by a single bulb at the 11 o'clock position. The light is sufficient and does make reading the time in total darkness easy. 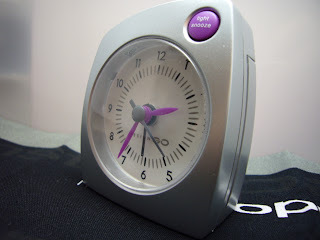 On the back we find the normal buttons for time and alarm adjustment. 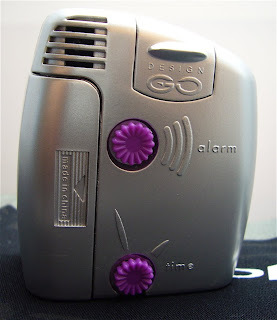 I like the fact that there are 2 crowns, one for alarm and the other for time. 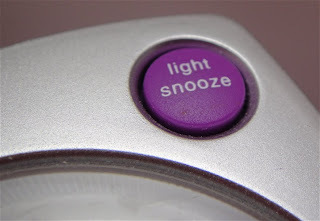 I do not like alarm clocks with single button for the alarm and time adjustment. You have to pull the crown out to adjust either the time or alarm. Usually the crowns are small, thus making adjustment difficult. That is why I like the setup on this clock. The crowns are clearly marked. 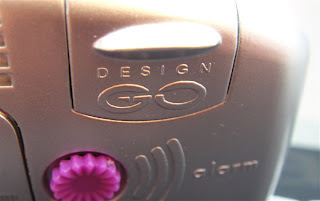 On the top, we find the alarm On/ Off slider. On it, we find the brand (also on the dial). 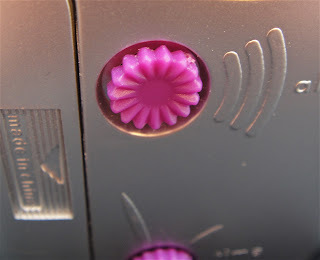 There is a raised notch that makes sliding the slider up and down easy. There is a positive 'click' when the slider moves up or down. Next to it we find the holes for the alarm speaker. As you can see from the photographs, the crystal is scratched and is already crazing. I guess this is due to the poor quality plastic used for the crystal. This does mean that the clock is not as robust as I would like it to be. In conclusion, I am alright with the clock. It was not very expensive and it does its job. It could be better if the crystal used was a bit more robust but for the price, I can't complain. On a side note, all the photographs above are from the Sony, while the photographs below are from the Leica. I could get closer to the subject with the Sony as compared to the Leica. Also I think the resolution of the Sony is better, but the Sony has double the pixel of the Leica. More photographs of the travel clock.